Chris has been involved in the town centre regeneration scheme for Douglas since day one. He’s working closely with Council members and technical officers, our government partners, craftsmen, artists and suppliers to bring about a cohesive, bespoke look that reflects the town’s unique ‘coast-meets-countryside’ location and maritime heritage. And, in the spirit of safeguarding the town’s environmental quality of life, Chris regularly cycles to and from work and encourages his colleagues to do the same. Oliver is the go-to person for all things town centre. He’s the recognisable face of Douglas Town Centre Management – except, that is, when he’s in costume for some of Douglas Town Centre Management’s more colourful events. He’s in regular contact with local retailers and businesses, working with them to devise events and campaigns that will help to create a year-round vibrant town centre and memorable visitor experience. Oliver’s also the inspiration behind this website and has become something of a ‘digital demon’, driving the content of Douglas Town Centre Management’s Facebook page. Click here to find out more. Kat looks after all of Douglas Town Centre Management’s paperwork – from busker bookings to Shopwatch administration – and is most often the first person people meet when they call in to 13 Church Street. She’s also a mine of information on what’s where and what’s happening in Douglas and, as a keenTV/Theatre acting student, is one of the first in the team to slip into character and costume for Douglas Town Centre Management’s events, from an elf at Christmas to a glamorous ghoul at Hop tu Naa. If there’s a Douglas Town Centre Management event on in Douglas, chances are Loki will be in the thick of things. 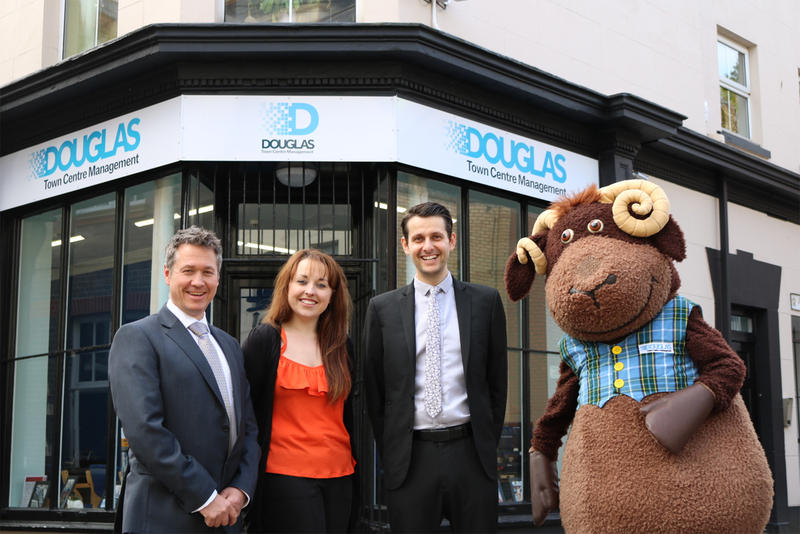 He’s the Douglas Town Centre Management mascot who is named after the Viking God of mischief and whose appearance is inspired by the island’s rare breed of sheep, the Loaghtan. But whether a god or mere four-legged ruminant mammal Loki’s a really friendly mascot, so do give him a wave next time you see him in Douglas.